Asthma is one of the most common airway diseases in the world. Patients with asthma often have breathing difficulties during normal daily activities or during the night while sleeping. They often suffer from wheezing and coughing attacks, which may be triggered and worsened by allergen exposure or by a viral infection such as the common cold or flu. During an asthma attack or during worsening of the disease, the airways are narrowing because of ongoing inflammation, muscle spasms and overproduction of mucus. Usually, this airway narrowing and symptoms are reversible after treatment, but in some patients, the airway wall is being continuously changed, in the process called airway remodeling. In our Asthma and Allergy Pathogenesis Laboratory at the Hacettepe University in Ankara, Turkey, we are working to understand the molecular basis of asthma and airway remodeling, as well as to design novel targets for potential treatment. Allergens are normal substances in our environment, such as pollen, house dust or fungi. They are usually harmless for most of us. However, in some people, the immune system falsely recognizes them as a threat. Following the inhalation of the same allergens by people who were previously sensitized by those substances, the immune system recognizes them and begins to change the lung structure in response. As a result of this change, the basic components of the lung that constitute the wall of the airways are damaged, and thickening of the airways is initiated. Depending on the amount of allergen and time of exposure, symptoms such as difficulty in breathing, coughing and wheezing can be seen. Even when patients are free of symptoms, they still might have ongoing inflammation in the airways, which leads to structural changes and thickening of their airway wall. This is called remodeling. This thickening occurs among other reasons due to the activity of protein-degrading enzymes called proteases, which are responsible for the digestion of the basic components of the airway wall. Normally, the catastrophic effects of proteases are neutralized by the protease inhibitors. However, in asthma, the balance between the proteases and their inhibitors is disturbed. There are 6 different protease groups that have been identified to date; each with its own inhibitor. Some allergens also possess protease properties. In a healthy person, when an allergen reaches airway epithelial cells it is recognized by the receptors on the surface of epithelial cells, and different pathways are activated. Once a protease expression against this allergen is observed, the signal for the expression of protease inhibitors follows, increasing their levels, and consequently bringing balance between the protease and its inhibitor. The regeneration in the tissue happens in a short amount of time. However, in asthmatic individuals, susceptibility to allergens affects the protease and inhibitor expression and causes imbalance. When proteases are overexpressed, but protease inhibitors expression cannot reach that level, we can observe thickening of the lung tissue. 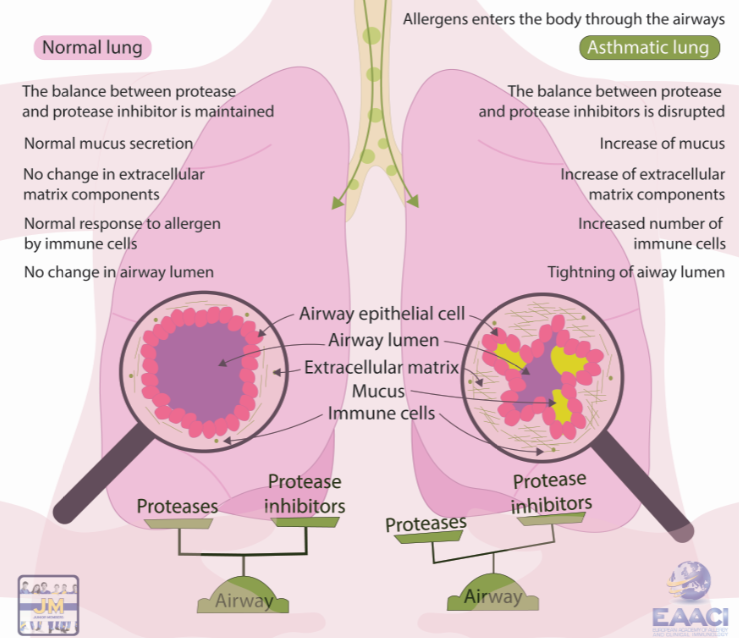 In our studies with epithelial cell lines and primary cells from healthy subjects and patients with asthma, we are trying to understand the balance between proteases and their inhibitors upon exposure to common allergens. In order to see the effects of protease inhibitors, we block the expression of inhibitor genes with “siRNA (silencer RNA)”. As the name suggests, we simply “silence” the genes responsible for the production of these inhibitors. We also block the receptors that recognize the allergen in order to find the molecular pathway regulating the balance between proteases and protease inhibitor expression. In summary, our aim is to unravel factors that drive the asthmatic lung to develop airway remodeling. Is it possible to treat asthma through airway remodeling? There are still many missing pieces in defining and explaining correlations between protease and protease inhibitors. Each molecule should be examined in detail to clarify what happens in the airways. My lab and I believe that our research can shed some more light on treatment of asthma, prevent worsening of this disease and inspire others to develop a cure for one of the most common diseases in the world. Author: Dilara KARAGÜZEL is an MSc. student at the Asthma and Allergy Pathogenesis Laboratory at the Hacettepe University in Ankara, Turkey under the direct supervision of Assoc. Professor Cagatay Karaaslan. 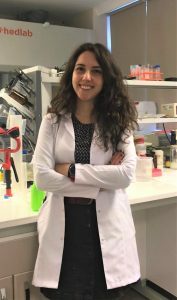 She is part of a research group interested in unraveling the protease activated receptor related mechanism(s) and airway remodeling in allergen induced asthma. She is working on her thesis about extracellular matrix proteases and their relations with allergens in the lung. Mentor: Dr. med. Milena Sokolowska (Head of Immune Metabolism at the Swiss Institute of Allergy and Asthma Research (SIAF), Davos, Switzerland) in the context of the EAACI Junior Member Mentorship Programme.